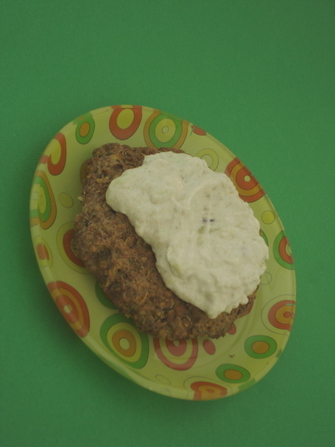 Tzatziki is a combination of garlic, yogurt and cucumber. It has a very fresh taste and it’s great when the weather is warm. And despite all the garlic, it is cooling. My tzatziki is slightly different from traditional tzatziki in that I halve the cucumber and add aubergine. The aubergine is not obtrusive to the taste and if you haven’t been told, you might not realize its existence. Still, it gives texture to tzatziki and makes it more satisfying. There are countless ways to make veggie burgers, and every vegetarian / vegan knows that. I just take a look in the cupboards to see what there is available and start from there. This time it was lentils and soya, next time it might be mushrooms or chickpeas. Cook lentils and soya mince in vegetable stock. Drain very well and put it aside to cool down. Puree mince and lentils in blender. Mix puree with 2 eggs and stir very well. If you don’t want eggs, substitute with oil and a little flour. Stir in oregano and salt. Shape into burgers and place on paper parchment. Bake at 350 F/180 C for about 20 minutes or until done. Serve with tzatziki. First, slice aubergine and fry in olive oil. We want it to be really tender, so pour some vegetable stock and let it absorb it. Once it is tender, strain very well and puree in blender. Grate the cucumber. You shouldn’t process it in a blender as that would make it watery. We want it to have some texture. Strain the cucumber very well. In a bowl, combine aubergine, cucumber, yogurt, garlic, vinegar, oil, salt to taste. Stir very well. Tzatziki is served cold. 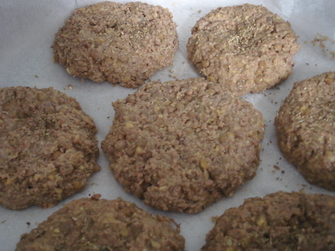 It is delicious with these vegetarian burgers but you can also eat it with dolmades (stuffed vine leaves) or as a dip. Only the pure at heart can make a good soup. People are at variance on the point of red food. Some say red food is not real food. I talked about it to my friend Steve and he said real food cannot be red. Not even tomatoes, “the devil’s food”. But this red soup is made of beetroot, not tomatoes. 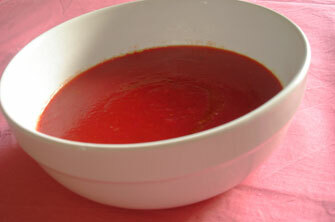 Just two beetroots and other vegetables too, which being of a more inoffensive colour, disappear in the soup. However, it is a very tasty soup, not to mention invigorative too. Beets are a very good source of potassium that regulates blood pressure, and vitamin C an antioxidant that works against free roots, against cholesterol, heart disease and other evil things. If you stll think red food is not food, thin it with some cream or soy milk or yogurt. That way it’ll turn pink. Pink is good. Try eating it while listening to Beth Orton’s “Comfort of Strangers”. Boil vegetables until tender. Peel them and cut in halves. Puree in blender. You might have to do that in batches unless you have a really big blender. Heat olive oil, add nutmeg, vegetable puree (it’s red!) and a glass of vegetable stock and let it simmer for 5 minutes so that everything is combined. Adding more stock depends on how thick or thin you want your soup. Alternatively, you can thin it with some yogurt or milk or soy milk. Sprinkle with some walnuts. Penny is my sister and this is her cheese pie. Of course she makes her own pastry. Truly, it takes less time that waiting for the ready made to defrost. The fact that my sister is on diet all the time, won’t stop her from making cheese sauce and adding it to the pie which she later gives to unsuspecting relatives. 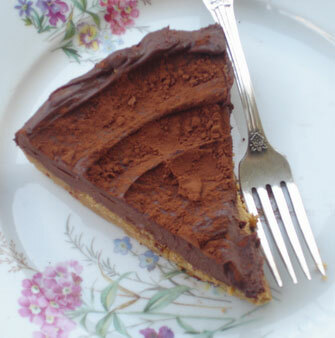 But because the pie is so delicious, I allow myself one piece for breakfast, from time to time. Then I watch buttons break loose. Mix all pastry ingredients and knead well. Make two balls. Leave it for half in hour to rest, in a bowl covered with a clean piece of cloth. Meanwhile prepare cheese sauce (see below). Mix all the filling ingredients in a bowl (don’t forget the cheese sauce!). Roll the pastry in two sheets. Roll one pastry sheet in a well oiled baking tin. Pour the filling on pastry. Cover with the other pastry sheet. In a small bowl beat some milk and an egg together. Coat the pie with this and bake in a preheated oven until golden at 180 C/350 F/Gas Mark 4. This usually takes 50-60 minutes. Melt butter in a pan. Add flour, stirring all the time with wooden spoon. Pour the milk (must be lukewarm) and cheese and keep stirring constantly over low heat, until thickened and smooth. The sauce is ready. Before you add it to the pie, sprinkle with grated cheese to make it crunchier. This recipe happened only because I had a spare pastry sheet in the fridge. But it was a success so it might become a classic. Where classic means, the food I prepare when I feel insecure and doubt my abilities and want to make something secure. It takes no time at all, although the pious are going to want to make their own pastry, which I am all for, but we’ll discuss it some other time. Whisk the eggs and add the feta. Heat olive oil in a skillet and sautee onions. Add mushrooms and when they are cooked but still al dente, combine in a bowl with the eggs and feta. Sprinkle with pepper. If your feta is very salty don’t add any more salt. Butter a 12 cup muffin pan (if you have a larger one, you’ll need more pastry and more of everything else) and roll out the pastry. We don’t want the pastry to have holes, so carefully, we press it inside the cups. When we are done, we separate the pastry with a knife, so that each cup is individually lined. 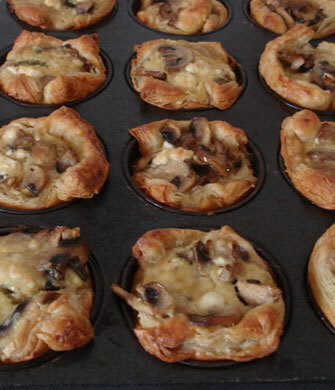 Fill with the mushroom mixture and arrange the extra pastry around, so that it encloses but doesn’t cover the filling. Don’t be too religious about it (as the photo testifies, I wasn’t). Bake in preheated oven at 180 C/ 350 F/ Gas mark 4 until the pastry looks golden and the filling has set. “Life is a combination of magic and pasta." Yeah, blame it on the pasta Bob. When I am stressed or worn out, I want to eat pasta. The ideal would be to make my own pasta (although, not penne, that would be a miracle in itself) but when I am tired, the last thing I want to do is make dough. Or maybe not. It might turn out to be soothing. Cook pasta in salted, boiling water. In a pan, heat olive oil and sauté onions and garlic. Add spinach and fennel and cook until the vegetables are tender. 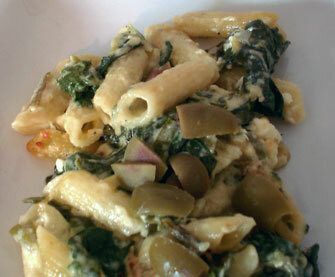 In a baking dish, combine penne and spinach. Add gruyere cheese and crumbled feta. Mix everything very well together. Bake in 180 C/350 F/Gas Mark 4 until all cheeses have melted and the food has a nice golden colour. Sprinkle each dish with sliced olives and serve hot. Αubergine salad is very common in Greece and there are numerous versions of it. This doesn’t mean there is no room for one more version: mine. Blame it for losing your friends if you want, but you can’t blame it for being tasteless. I think it’s a great sandwich spread too, especially combined with mozzarella. Just stay at home, alone and contemplate for a couple of hours after you have had it. Please, before you serve it ask people if they are allergic to walnuts. Many people are, and it just never crosses our minds to ask. But we could kill them with the walnuts before we had a chance to kill them with our garlic breath. Cut the aubergines in squares. Heat olive oil and sauté 2 garlic cloves, then add aubergines and cook until they are tender. If you see that you are running out of liquid in the pan, add some water. Purée the aubergines in a blender. Add one more garlic clove, 1 tablespoon olive oil, ½ tablespoon balsamic vinegar in the blender bowl. Also, add the capsicum, the walnuts, salt and pepper. Puree again and add more salt, pepper or balsamic vinegar if you want. 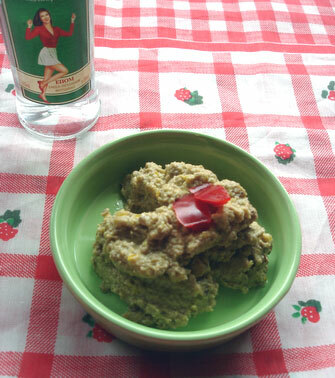 Serve cold with some finely chopped walnuts on top. I thought I could make this recipe when I have people over and am too bored to cook properly for some reason (what reason?). It looks impressive although it’s very easy to make and it is very tasty, with all the vegetables of the good lord in it. And with some white wine it goes down very well indeed. Cut the each pastry sheet in 6 oblong pieces (round are okay too). Pierce them with a fork (we don’t want them to get too puffy), place them on a baking sheet and bake them for 20 minutes or until golden, at 220°C. In the meantime, heat half the oil and sauté the garlic and mushrooms until tender but not too tender. Add the wine, cover and let it simmer for 3 minutes. In a frying pan pour the rest of the oil, the peppers and the zucchini and fry until tender. Mix mushrooms, peppers and zucchini and taste for seasoning. Now the pastry is ready. 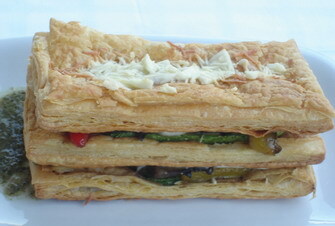 On a piece of pastry layer the vegetables and sprinkle with the cheese. Top with another pastry square and again, add a layer of vegetables and cheese. 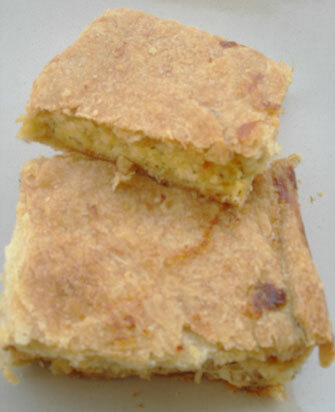 Top with a third pastry square and sprinkle with cheese. Bake the Mille Feuilles for about 5 minutes or until the cheeses have melted and serve hot with a spoonful of pesto sauce on the side. Put the garlic and basil into a pestle and mortar and pound. We add the pine nuts and pound again. Turn out the mixture in a bowl and add parmesan and pecorino and stir. If you want you can omit the pecorino and replace with parmesan. I do this for this recipe only, so that it isn’t too salty. Add oil, little by little, and go on stirring, until it becomes a wet paste. All the time taste for seasoning. We can do it in a blender but with the pestle, I think the flavours really come out. 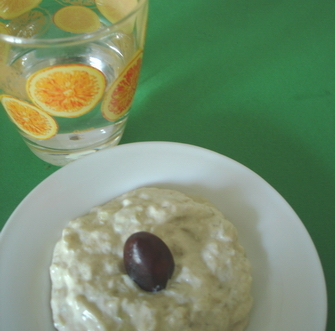 Magiritsa is a traditional Greek Easter soup. 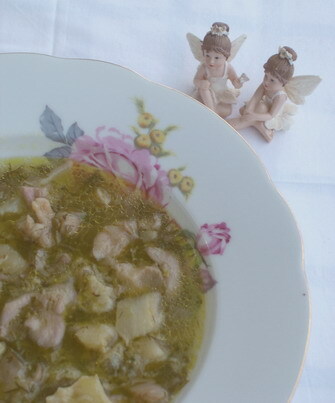 In fact it is the very soup that Greeks break their 40 day fast with, after they have returned from the midnight mass on Easter Saturday. This soup is traditionally made with lambs' innards and avgolemono, an egg and lemon sauce. Some people also add rice but I don’t think it’s necessary. I know that Easter is in April but I have already made my magiritsa for the magazine which is always a month ahead at least. So I am used to cooking Christmas food in late October and Easter food in early March. Still, my version of the soup is fine for Lent too since it has neither innards nor eggs. It is made with oyster mushrooms -so it retains some of the texture of the traditional thing- and all the usual vegetables and herbs like dill and spring onions. It is very very tasty, a fact admitted by sworn carnivores too. Sautee the onions (not the spring onions) and oyster mushrooms. Chop the artichokes and put in a large pan along with vegetable stock. Bring to the boil and then reduce heat and boil for about 30 minutes. In a bowl add ¼ cup water, corn flour, lemon juice, spring onions and dill. Stir well and add the mixture to the pan with the vegetables. Cook for another 5 minutes in moderate heat. Season to taste and add more lemon juice if you want to. Artichokes are rich in magnesium, potassium, phosphorus, iron, calcium and have antioxidant properties. All these wouldn’t be of interest though, if they weren’t yummy. If we don’t give a fig about calories, we can replace cottage cheese with feta. Cut the artichoke stalks so that the artichoke can stand on its back, cut the top leaves, pull the outside leaves off until you find the tender ones. With a spoon remove the inside of the artichoke. Put them in a bowl with water and lemon juice for about 15-20 minutes. This prevents them from going brown. Leave them to dry and then put them in a pan with boiling water with some lemon juice in it and a tbs of butter and some salt. We want them to be tender but not too tender. They must be strong enough to hold the stuffing. When they are done we let them dry. Melt the cheese in a bowl and stir in the mashed potato. If this is too thick, add one or two tbsps of milk. Heat the oil and add onion and garlic. Sautee for a while and then pour this into the bowl with the cheeses. Blend everything together. Grease an ovenproof dish with some butter and arrange the artichokes neatly in. Sprinkle them with some oil. Stuff them with the cheese-onions mixture and sprinkle with the parmesan and then breadcrumbs. If there is any cheese left, pour it among the artichokes. Bake in moderate oven for 15 minutes, or until the cheese has melted and they look golden. 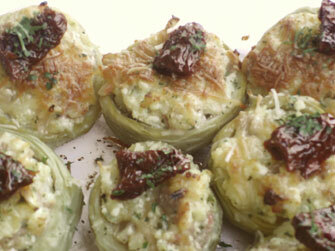 Serve with a sun dried tomato on each artichoke and chopped basil.